OK, I was called out by DD and I can't let that pass. But first, thanks to Stonehouse for an eloquent and accurate statement about UP's role in, and intentions for, the NP Greenway Trail on the Franz River Campus. UP is "all in" regarding the trail and some of what has been written by trail advocates and others regrettably contain misstatements due to lack of factual information. A few other comments are just plain wrong. There are joint use/ownership issues involved between UP and UPRR that I am confident we will work out. It will take a bit of time but overall our experience in past dealings with the railroad has been a positive one. I am asking Pilot Nation to have a bit of patience as we work things out. We will soon solve this matter and announce a solution satisfactory to all involved. So please stay tuned! Shadrach wrote: I am asking Pilot Nation to have a bit of patience as we work things out. We will soon solve this matter and announce a solution satisfactory to all involved. So please stay tuned! Thanks, Shadrach....I don't think any of us are impatient, it's the two wheelers that ride through stop lights and stop signs that seem to be impatient. Everyone on this forum is looking forward to the time when we can enjoy sports on the new Franz Campus....and maybe even find a parking spot too. DD wrote: Everyone on this forum is looking forward to the time when we can enjoy sports on the new Franz Campus. Something that has not been discussed with the Franz Campus updates: the baseball stadium. It would seem to me that any large athletics donations these days would (hopefully?) include the final remaining funding for the grandstand? Has anyone heard if this was part of this round? I know there was mention of the Athletic Dept. inking a large donation soon for this purpose--but was it part of the Franz donation, or is it still to come? PilotNut wrote: Something that has not been discussed with the Franz Campus updates: the baseball stadium. It would seem to me that any large athletics donations these days would (hopefully?) include the final remaining funding for the grandstand? Has anyone heard if this was part of this round? I know there was mention of the Athletic Dept. inking a large donation soon for this purpose--but was it part of the Franz donation, or is it still to come? I too had thought the Etzel Field renovation was fully funded, but apparently that is not yet the case. There is no connection between the Franz Campus and Etzel Field with regard to funding...they are completely separate. It looks like UP is still waiting for a couple of large gifts to complete the final phase (or a bunch of small ones), but in the meantime I believe they are moving forward on contracts and permits. Best guess is construction will start next spring, after the 2019 baseball season is completed, so as to not displace the team during the construction. In honor of the Franz family's generosity to the U, I have edited the title of this thread from "Rendering of River Campus Track" to "Rendering of Franz Campus Track". The Franz moniker was not in use when this thread started. I was up on campus last week, and snapped a couple photos to show that construction on the 2 practice fields has commenced! I've been told that the entire Franz Campus project has been funded... and construction will be completed generally clockwise in this order: artificial surface practice field ready this fall, grass field next spring (it will be planted this year, but will need to sit over the winter to let the grass mature), dock & boathouse, then the track, then the Physical Plant building, and finally the new Tennis Center. If you are near campus, you can now drive/walk down, by accessing it from either N Portsmouth/Bluff St (where the photos below are taken from; the Rowing Dock and House will be on the water where those existing piles/over-water structure are) or N Vanhouton Pl (behind the President's house--there is already some new parking down below on this end). 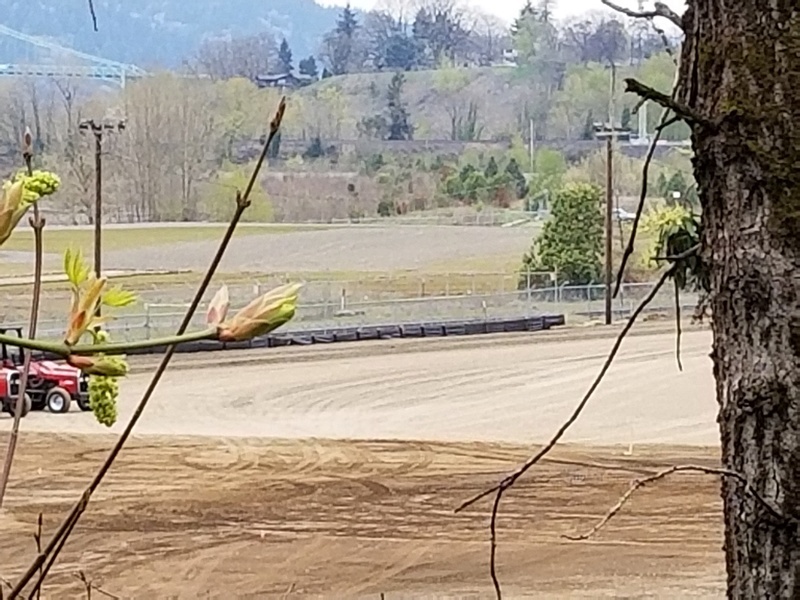 In the 4th photo, I tried to show the area beyond the fields where it would appear the track will be. Gosh, the Tennis Center looks incredible. Flyover video of the Franz Campus... shows the track, tennis center, boat house, dock, and soccer fields. Also shows the new physical plant building. This is such an incredible project. So many exciting things coming in the next 2-3 years! Did stuff get pushed back? A year ago things were supposed to happen this summer. Recently the expectation was next summer. 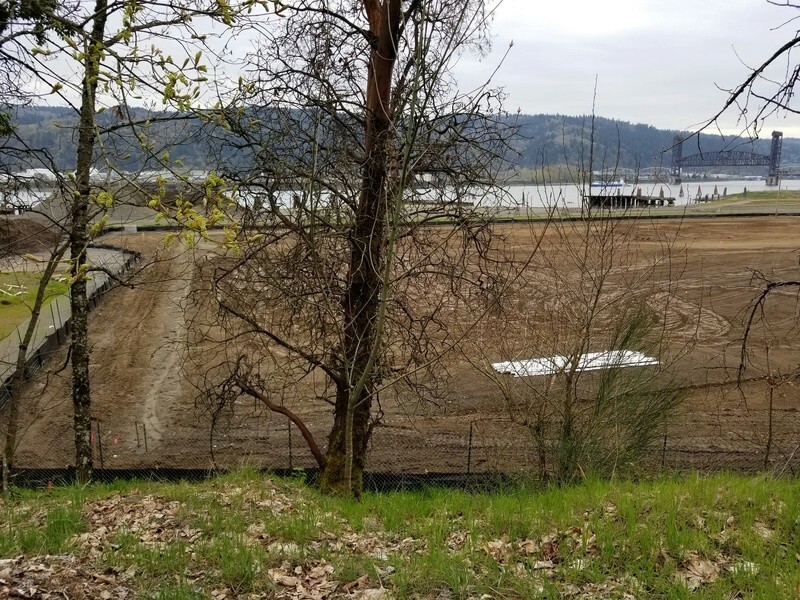 The 2 practice fields are complete, and I believe there has been a delay on the boathouse/dock construction related to permitting and the river rehabilitation. It does not sound fundamentally problematic, rather just time consuming to re-address some of the red tape items (lots of irons in the fire). I do not know if they are proceeding ahead of schedule on other items in the mean time, or if those will remain on their original schedule. Here's glimpse at the Franz River Campus development timetable. This summer both new soccer fields w/lighting were completed and are in use today by both varsity and intramural teams. Field lights are installed but not yet powered up so it's daytime use only right now. Power should be available later this year. Plans to build the new tennis center, physical plant, and track complex are on target for completion in 2-3 years - that hasn't changed. 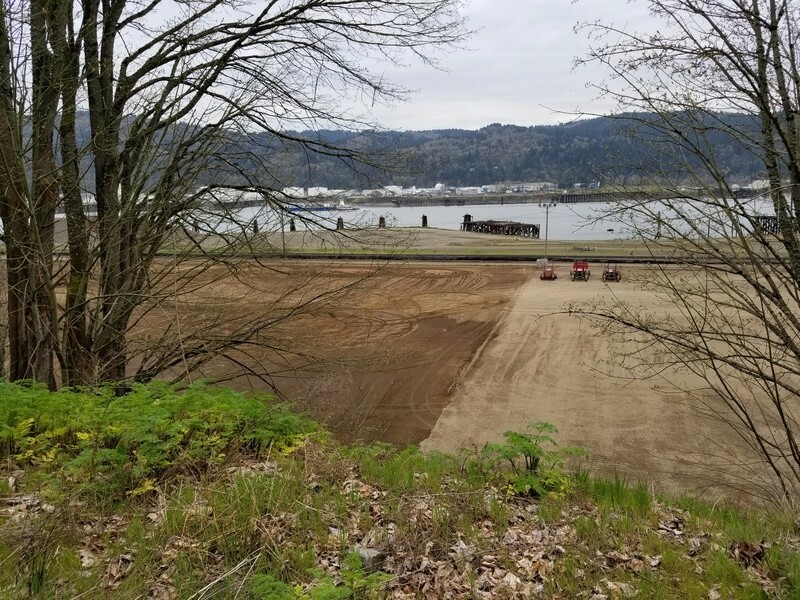 What was postponed was the habitat restoration project (removal of derelict docks, piers, and pilings off the shoreline) which pushed back the rowing dock & boat house projects. 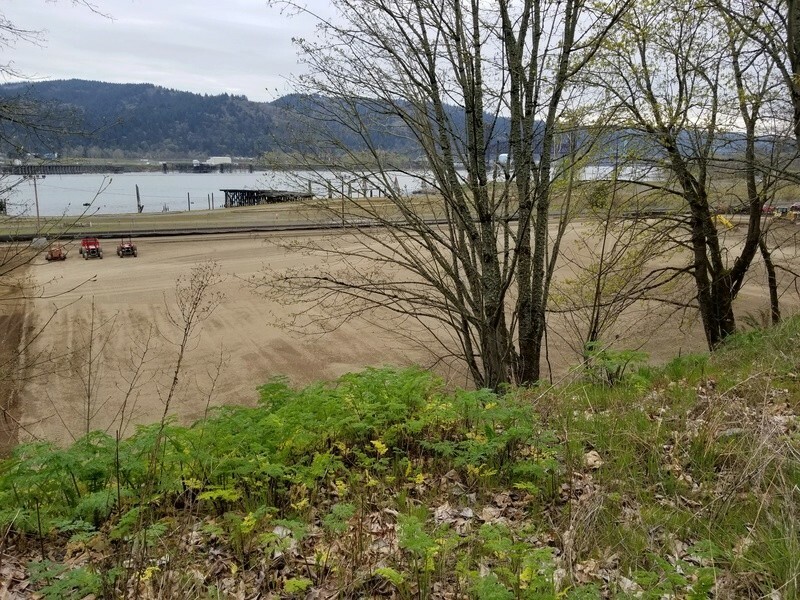 Despite our best efforts we could not gain approval from the Natural Resource Trustees in time for a July 1, 2018 start date on the dock removal project. So we've set our sights on July 1, 2019. Work in the river is restricted to only 4 months a year (7/1 through 10/31 - the so called low water months) in order to provide the greatest protection to migrating salmon and other endangered species. This is a federal requirement we must comply with. The docks and pilings constitute a significant risk to our rowing team if they remain in place so we plan to remove them before building the rowing dock and boat house. The plan designs for the rowing dock and boathouse are shown in the video and they are magnificent. UP has been fully engaged with the City of Portland in the Greenway (GW) Review process for the entire Franz River Campus for the past 4-5 years. Two of four separate GW review applications have been approved resulting in the construction of a 113 space parking lot (1st review) and the construction of 2 new soccer fields (2nd review). The 3rd review (for the in-water work to remove the dock structures) received staff approval and is currently in the public comment phase. We expect full approval in about 6-8 weeks. With approval of the 3rd GW review in hand UP will continuing working with the Natural Resource Trustees to achieve a 7/1/19 start date for the project. The 4th (and final) greenway review application is in the works right now. We hope to submit it to the city soon with approval anticipated early next year. Included in that application will be plans for the tennis center, physical plant, and track complex along with associated road improvements, parking, and utility location, etc. If all goes well we hope to submit applications for building permits early in the spring of 2019. The Franz Campus is a truly transformational development opportunity for the University. All members of the UP community - past, present, and future - can take great pride in UP's efforts to bring this former contaminated industrial site back to full life and positive beneficial re-use for the future. Thank you for the detailed response! This is so exciting! !